Sir Lenny Henry has said that young people need to see themselves reflected in TV shows if producers want to keep them watching, as he called for increased representation in the media during a special live event celebrating his role as Chancellor of Birmingham City University. 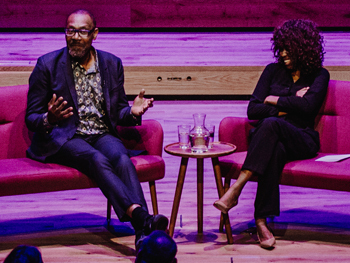 The actor, comedian and charitable campaigner spoke to an audience of 500 staff, students and the wider public at an event titled ‘Sir Lenny Henry in Conversation,’ which was held at the University’s Royal Birmingham Conservatoire. During an hour-long live interview with broadcaster June Sarpong MBE,the Dudley-born star said he was proud to be involved with activity to increase representation in his industry and that there were a number of initiatives taking place to boost inclusion. During the talk, Sir Lenny took audiences through highlights of his career from his breakthrough on New Faces and first appearance at Wembley Stadium, to his work with Comic Relief and completing his PhD last year. I was on the original reality show New Faces, and I won. And it changed my life forever. "It changed my life forever because I was known in Dudley, and then I won New Faces and I was known in Leicester and Derby. “When it came time to perform on television on January 8th 1975 I thought ‘I’ve got to practice it’. I went all over Birmingham and Wolverhampton and Walsall and West Brom, I practiced it in front of audiences. The event gave fans a chance to put their questions to Sir Lenny, and he was told stories of how his own journey with education had inspired others to take up degrees later in life. He was also united with a Tiswas fan who said she had written weekly letters to him during the 80s and described him as her ‘hero’. Sir Lenny Henry in Conversation, formed part of Birmingham City University‘s public lecture series City Talks which welcomes a programme of guest speakers into the University so share their views and insights on a range of topics.